More shocking than ever! 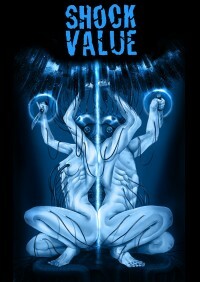 Shock Value Blue features more tales of the surreal and horrific from writers and artists gathered together from around the world. In ‘Mandy and the White Rabbit’, by Matt Warner & Anna Susanne, Mandy the monster hunter investigates a little girls claim that ehr cuddly pet might be hiding a dark secret. ‘Incandescenza’, by Atlantisvampir, is an award winning short comic. In ‘Slaughterhouse Farm’, by Matt Warner, AJ Ballard & Arfon Jones, a trip to the Welsh countryside reveals a darker, and bloodier, side to rural farming. In ‘Amen’, by Atlantisvampir, the divide between dark and light, and right and wrong, have become blurred in a post-apocalyptic landscape. In ‘Thy Father Lies’, by Mark Adams & Anna Susanne, a deep sea research base comes under attack from a creature that dwells in the deep. Also included is exclusive pin-up art by Atlantisvampir & Anna Pennlund.